There aren’t many games that force you to play with a specific controller or add-on that doesn’t come bundled with it in the first place. A relevant example is Wii Sports Resort, a game built to showcase the Wii MotionPlus augmentation that was included in the initial run. Go Vacation, from Bandai Namco, makes the assumption that you already own the MotionPlus enhancement, and have clearly gone to great pains to render the game about as responsive as a remote control brick for those players who have yet to upgrade. Conversely, Wii Sports Resort is perfectly playable without the additional accession. One point to Nintendo. My initial twenty or so, tooth grinding minutes of playing this latest collection of sport-themed mini-games consisted of wrestling my character across the screen, looking like I was trying to tow an aeroplane. This can’t be right, thought I. Nobody – particularly Bandai Namco, innovative developers of the Katamari series of games – could expect any fun to be had here. It was only when my multiplayer partner-in-crime joined in using Nintendo’s turbo-charged saviour, the MotionPlus controller, that Go Vacation‘s biggest flaw was exposed. Getting the most out of Go Vacation means playing with two or more players, each using a MotionPlus controller. In most households, mine included, there is generally one MotionPlus and two or three regular Wii Remotes knocking about, should Wii Sports resurface. If you’re playing Go Vacation and you’re lucky enough to be the player with the souped-up Wii Remote, expect to win. A lot. Go Vacation should have had a warning on the box. So, correct controller finally in hand, it was time to go on an adventure holiday, Wii style. 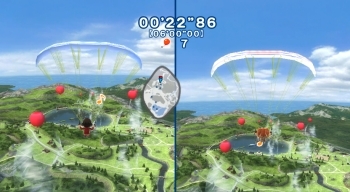 Go Vacation is not unlike Wii Sports Resort in that the game takes place on an island on which there are various diversions that can be enjoyed solo or with up to three friends. Kawawii Island is divided into four distinct resorts: snow, city, mountain and marine, each offering activities specific to the theme of the resort. The island can be explored at leisure on foot, roller skates, or buggy – a kind of off-road golf cart – and every activity is available from the off once you find it, and subsequently available in Free Play. Trekking about Kawawii on foot is diverting, to begin with – there are some lush views to take in and photograph using your character’s camera – but in time, once you get a handle on which activities you will be returning to time and again, it’s much easier to simply select from a menu and ‘Warp’ to your desired location instantly. A lot of time and effort has obviously gone into the resort’s surrounding areas, and a little encouragement from the developers may have enticed me to take in the sights a little more. Perhaps a few secret events, hidden beauty spots maybe, yet walking around is a solitary pursuit (even the NPC’s have little to nothing to say when approached) and playing a game such as this by yourself is rather contrary to the point of owning it. So a large chunk of the title is visited only occasionally to spare boredom descending on your opponent in waiting. The games themselves are rather hit and miss, depending on your set-up (don’t forget that you each need MotionPlus). 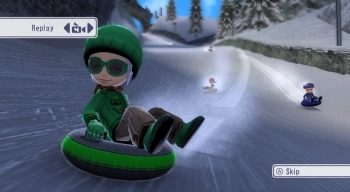 If you are lucky enough to have the full complement of Wii accessories then you can go surfing using the Balance Board, a bit of archery using the Zapper, and a large variety of races are brought to life with the Mario Kart wheel. All events are playable without the additional equipment, but the fun-factor of each is diminished. There is a great sense of ‘doing’ with many of these activities; roller skating and mountain biking, for example, implement the Wii Remote and Nunchuck to great effect by asking you to alternately ‘pedal’ with your arms to propel yourself, leaning to steer – which works well without the Balance Board but is infinitely more engaging with. Sadly, there are more than a few events that let the whole package down. Skydiving in itself exposing flaws in the game’s engine – I can see the horizon but am unable to see the edge of the island? 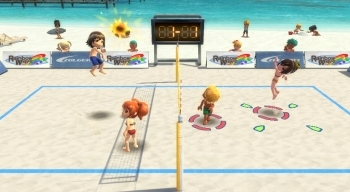 The Wii may be no power-house but, come on, it’s hardly a PSone, and some team events such as Volleyball require little interaction from the player other than swinging the Wii Remote to hit the ball, the player’s movements otherwise controlled for you. There are fifty minigames on offer and of those, it is likely that I would return regularly to less than half. It’s a shame that a game such as this, with so much variety and so many ways to engage multiple players, should lose points because of some under-developed ideas. Visually, while you’re on the ground at least, and aurally, Go Vacation is remarkably polished. Turn off the God-awful ‘muzak’ and let the sound of lapping waves or ski’s ‘shh-shhh’-ing down the piste really envelop you in an island atmosphere unmatched by Nintendo’s best effort. The illusion of immersion is unfortunately snatched away when you integrate your Mii into the surroundings. The little guys are perfectly at home in Wii Sports Resort but look incredibly out of place next to the emotive cartoons that populate Kawawii Island. A mixed bag, then. But with fifty events taking place across four visually distinct areas you’ll find enough to keep you entertained. In terms of supported peripherals, Bandai Namco has left no stone unturned and that is commendable, but the other side of the coin is that to get the most out of Go Vacation is a very costly endeavour indeed. In fact, you could probably take yourself on holiday with all that cash.